The best companies win with highly talented, highly committed employeeshiring and developing the best talent is essential. 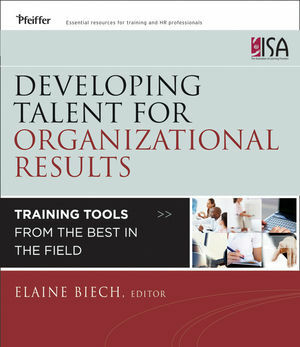 In Developing Talent for Organizational Results, Elaine Biech brings together the work of many of the most renowned learning providers in the worldall of them members of ISA: The Association of Learning Providers. Filled with a treasure-trove of consulting advice from The Ken Blanchard Companies, DDI, Forum, Herrmann International, Bev Kaye, Jack Zenger, and others, this book delivers the answers you want to improve leadership, management, and communication skills; address training, learning, and engagement issues; and shape the culture and care for your customers to achieve desired results. Elaine Biech is president and managing principal of ebb associates inc, an organizational development firm that helps organizations work through large-scale change. The recipient of ASTD's highest honor, the Gordon M. Bliss award, Biech is the author and editor of over four dozen books, including The Book of Road-Tested Activities, Pfeiffer Annuals of Training and Consulting, 90 World-Class Activities by 90 World-Class Trainers, Training for Dummies, The Business of Consulting, and others, all published by Wiley. ISAThe Association of Learning Providers, founded in 1978, is the only industry specific association devoted exclusively to the issues and needs of business owners, founders, CEOs, and leaders in the training and performance industry.